Today’s march in Macroom is ahead of a larger one in Dublin on Wednesday. Twomey during her Cork-Dublin walk. VERA TWOMEY AND her supporters will be marching in Macroom today ahead of another protest at the Dáil in Dublin on Wednesday. The Cork mother has been campaigning for a new cannabis-based medication for her daughter Ava who suffers from a rare form of epilepsy. Twomey told TheJournal.ie that Ava had another seizure this week after contracting an ear infection. Today’s march begins at the Dunnes Stores car park in Macroom at about 1.30pm and will proceed towards the town’s square. It is being organised by friends of the Twomey family and the Facebook event page calls for people to bring “placards, banners and your voice”. 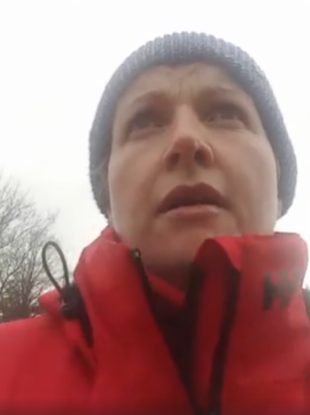 On Wednesday, Twomey will return to the Dáil for another protest just over three weeks after completing her protest march to the same location. Vera Twomey wants her daughter to have access to a cannabis-based product containing THC. Ava Twomey is already being treated using cannabis-based CBD oil. The child was taken to her GP this week after an ear infection brought on another seizure. “My daughter is non-verbal, so its very, very hard to tell exactly how she feels about her seizures,” Twomey said. Email “Vera Twomey to march in Cork as Ava's ear infection brings on seizure ”. Feedback on “Vera Twomey to march in Cork as Ava's ear infection brings on seizure ”.